Post-industrial cities have long struggled to find new uses for the (often gargantuan) factory infrastructure that once made their towns boom. Usually, that means a park or a museum. But a few cities—like Genk, Belgium—have tried a more experimental approach, turning these decrepit sites into unusual creative spaces. The Winterslag mine is on the eastern border of Belgium and Germany in Genk, where coal was discovered at the turn of the last century. The town became an actor in the vast power supply chain that powered Europe for eight decades, until the mines closed in 1988. Since then, the small city has worked to turn the remains of the mines—from dozens of processing buildings to a network of underground tunnels—into a multi-use community center called C-Mine. For example, one portion is now an operating movie theater. Another, a high school for media and design. The former slag heap? It’s a hiking area. 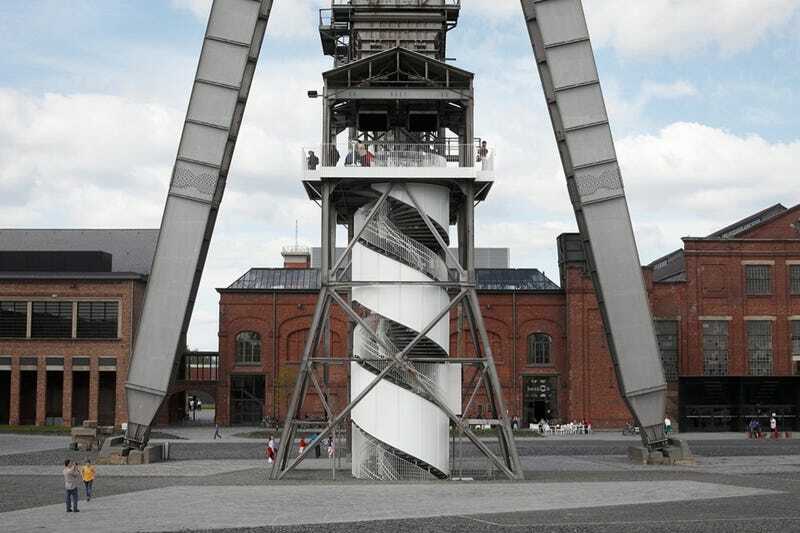 The latest transformation in Winterslag comes thanks to NU architectuuratelier, who turned the mine’s old ventilation shaft into an elegant “experience space,” where visitors can explore a warren of underground tunnels and climb to the top of the Winterslag's 180-foot-tall ventilation tower. Unlike a museum, the so-called C-Mine Expedition doesn’t follow any set path. “It takes visitors through a range of different disorienting spaces, starting with an archive that carries out the memory of the mine-industry,” explain the architects. That includes atmospheric spaces where sounds and images from the former mine fill the cavernous space, as well as site-specific installations from artists. Finally, the ventilation tower—which was built around 1912—was converted into an observation deck, organized around two double-helix staircases.